Filling the middle of the 2016 summer season was the clever Goodbody's Gold, once again written by D. Chappele, our go-to melodrama author! With many of the same talented cast back for another go, this show featured the most audience interaction to date! Who can forget the "hey, that looks good, mind if I have a bite" bit during the villain/hero chase around the audience! Directed by Laura Johnson, Goodbody had many side-splitting moments. After all, who would want to continue operating a silver mine when all that stupid gold was found! Terribly innocent daughter Sugar Goodbody (Teresa) , helped along by Grammie Grumpee (Brigitte) - need we say her name fit her personality? - to flame the sparks of romance with their silver mine manager, Grant Cash (Jake). Ignatz Fowler - is Mykey being typecast as the villain?? - is the lawyer trying to get his hands on the mine with the help of Teddi Bustier (Samantha) whose change of heart is key to a happy ending! Happily, Patty Albertson, a long-time Fergus Falls musician, took up playing piano during the show and intermission, adding that dramatic music touch. Wonderful! Once again, prior to getting grub, the audience enjoyed the outdoor town meeting by the sherrif (Jake Boerhave) who warned town citizens about the dangers of bandits (alternately played by Laura Johnson and Rick Schara). 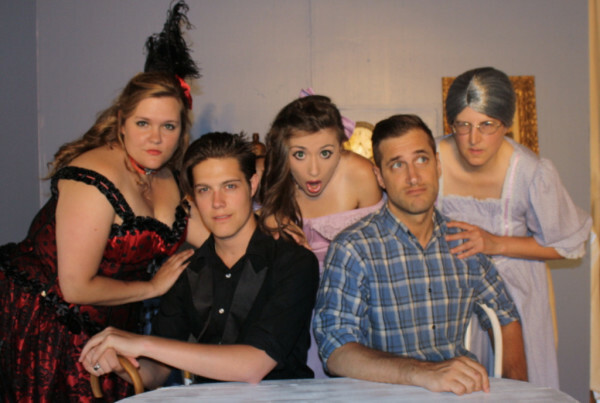 Cast of Goodbody's Gold, from left, Samantha Bottko, Mykenzey Watchorn, Teresa Widiger, Jake Boerhave and Brigitte Munsterman. Ah, so sweet and innocent! Can you believe your eyes! ?